Two years ago, we completed a comprehensive planning session at Real Estate Webmasters. We just finished another one for 2016, which gave me cause to look back at all we had accomplished since that first one in 2015. The amount of positive change realized is amazing, so I want to share the approach we took. I promise you, if you take the time and apply these principles to your business you will reap the rewards. It’s not magic, it’s just tried and proven processes that get results, and yet the vast majority of real estate professionals will never do them, which is why 20 percent of the people in real estate make 80 percent or more of the revenue. 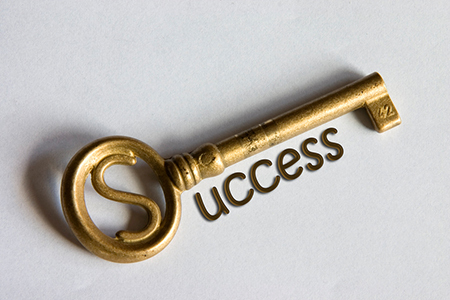 These keys will most definitely help you to be in that top 20 percent. Once you have benchmarks established, you will give a rating for each of the items that you can measure against as you move forward. The first key though is to do that initial evaluation and get those foundation benchmarks. You can do that by hiring a consultant, doing surveys, conducting interviews, monitoring analytics etc. At the end of the process, you should be able to look at your business in detail and see which areas are doing great, which need improvement and which are really messed up. Remember, keep your egos out of it; this is about getting better! Notice that I did not say “set goals and objectives.” They need to be specific because once we set clear, specific goals, our subconscious minds kick in and drives us to achieve them. We need to be clear and give our goal direct, clear targets to hit. So this step involves first identifying the key areas you need to address, and then prioritize them. You may not be able to do everything at once, so make sure you know which are the most important. We recommend no more than 10 specific goals to start. What are we doing right now that is working perfectly? What can we do to make this even better? Is there anything we are doing in the process that isn’t contributing to its success? What can we add to this to make it even more successful? It’s amazing, but if you ask the questions the right way you will come up with good answers. Often we just aren’t asking the right questions. Try it! Fixing things is our natural tendency, because we are talking about fixing things that we bought, implemented or hired. It goes back to that “blind spot” we all have when we look at ourselves. It can be difficult to acknowledge that something is just broken and needs to be thrown out. So, once again, as you look at the parts of your business that aren’t working try to find ways to be objective. If you can’t do it yourself, get someone you trust to bounce things off of. If I was investing in this thing, with my own money, would I feel confident it can be improved? Why or why not? Do I see specific things I can do that I am confident will make it successful? Can this person be helped/trained to do what is necessary and good for the business? Have I been clear with this person or those responsible for this process about what I specifically want or need? Are there things I am doing or not doing that is keeping that person or process from being successful? Note: Be careful before you use the axe on a process or person to make sure that the problem is not with you not providing proper direction, management or training. If you have done all you can do, get out the axe! This is often the easiest and most fun thing to do during this process. It is where you can get really creative and think out of the box. Throw anything and everything onto the table for discussion. At the end of the day, identify things that you believe have a great chance of helping you to make real improvements in your business. Action plans are probably the most important part of the process and yet they are probably the hardest to get people to do successfully? Why? Because they force us to move outside of our comfort zone to be objective and accountable. Face it: you are the boss, you run things. Do you really like something or someone telling you that you aren’t living up to your commitments? That is what action plans do, not just for you, but also for anyone tasked with specific responsibilities. 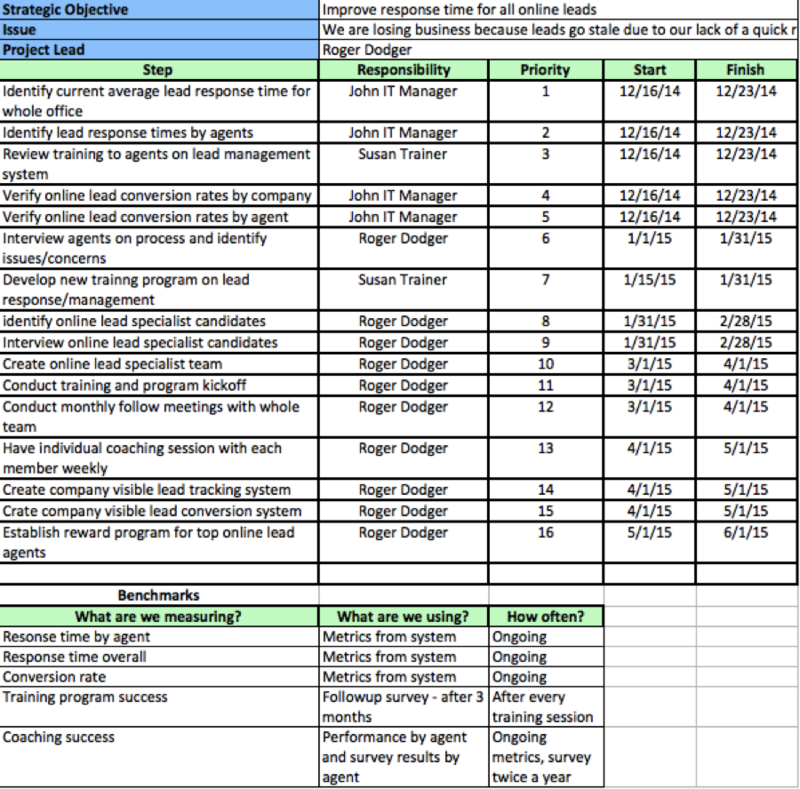 Take your top goals from our prioritization list and build action plans. They identify someone, one specific person, responsible for that task. Other people can help but you need to make one person accountable. They list the specific tasks necessary to be completed to do the task successfully. They put dates for completion on each specific task. The include benchmarks so progress can be measured against the Action Plan. Note: The power in the action plan is only realized if you monitor it and hold people accountable. The plan is just that, a plan, and we all know that sometimes things happen that are unavoidable that impact our ability to hit a date. When that happens just re-evaluate a step and adjust the plan. It is also extremely important that you communicate plan progress on an ongoing basis. Transparency is hugely effective in motivating teams. The above plan is an example for one specific task. Remember, you will have many things to do to be more successful, but you can’t do them all. Prioritize wisely, create plans for your top issues/goals and get moving. If you find you have more bandwidth, work on more goals and plans but it is better to do 2 or 3 things well and completely than 10 things poorly. For more information, visit www.realestatewebmasters.com.